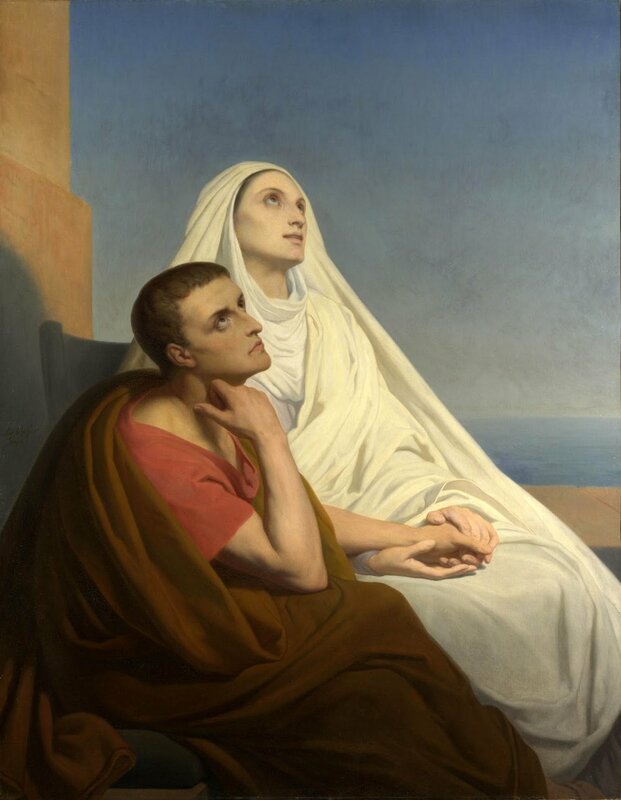 Most of us think of Saint Monica in association with her son, the great Saint Augustine. This is understandable for two reasons. We are familiar with the famous painting of the parting of Monica and Augustine at Ostia. Familiar, too, are the now famous words of an unknown bishop to Saint Monica: ‘The child of such tears will never perish.’ We are introduced, as it were, to Saint Monica sorrowing. Sorrow played a big part in the life of Saint Monica; the sorrow of a loving wife for a harsh spouse and a devoted mother to a wayward son. Life was not kind to Saint Monica. Her husband, Patritius, was a pagan. Though naturally generous and kind hearted, Patritius was a harsh and unfaithful husband. His mother and servants took their cue from him in their treatment of his young wife. Monica bore her difficulties with patient cheerfulness and. her conduct profoundly influenced Patritius, finally bringing him to the gift of faith after twenty years of married life. Wife beating was common among the pagans and Monica’s neighbours marvelled that not once did Patritius strike his wife. Saint Monica had three children, two boys and a girl – Augustine, Navigius and Perpetua. Augustine, the eldest, was born at Tagaste on November 13th, 354. In another place Saint Augustine tells us: ‘By Your great mercy, O Lord, my tender heart imbibed with my mother’s milk, the sweet name of Christ, Your Son, my Saviour; and ever after nothing, be it ever so learned, ever so polished, ever so true, could, if devoid of this name entirely carry me away.’ ENTIRELY carry me away! But partly, almost completely, carried away Augustine was. The explanation lies in Monica’s one fault – she deferred her child’s baptism and paid the price of thirty-three years’ anguish. Alone with her grief, but incessant in prayer, Monica witnessed, through many years, the acute mental and moral struggles of Augustine. His great intellect had to be convinced of the truth of the Catholic Church. He was left to struggle alone. Saint Ambrose, Bishop of Milan, the only man who could have assisted him left him entirely to himself in this matter, relying on the prayers of Saint Monica. ‘Often when we met,’ writes Saint Augustine, ‘he used to break forth in praise of my holy mother, congratulating me on having such a mother, not knowing what a son she had in me who doubted all things.’ Saint Ambrose knew, in spite of Augustine’s conviction to the contrary. But Ambrose was wise in the way of souls and his wisdom counselled silence. Step by step, Augustine fought his way to the final conclusion that the Holy Scriptures and the Catholic Church had an undoubted claim on his assent and obedience.